When we measured the time it takes for the info command in the old vs. new CLI, it decreases from 1690 to 1210 milliseconds in Unix, and 3409 to 944 milliseconds in Windows! Though individual results will vary, you should experience faster response times on average across all commands. You might have noticed some improvements over the last few months, but to get the fastest version you’ll need to uninstall and reinstall the CLI, because we’ve rewritten it in Node.js with new installers. The good news is that this should be the last manual update you’ll ever do for the Heroku CLI: the new CLI will auto-update in the future. Then download and run the OS X installer. Select Heroku CLI, and then click Uninstall. Delete the .config/heroku directory inside your home directory. Then download and run the Windows installer. For the last few of you who are still using our very old Ruby gem - now is a great time to upgrade to the full Heroku CLI experience. Please let us know if you run into any issues with installation as we’re here to help! The new CLI includes a number of user experience improvements that we’ve been rolling out over the past few months. Here are some of our favorites. We’ve learned that while you value human-readable output, you want grep-parseable output too. We’ve standardized the output format to make it possible to use grep. If you want even better tools to work with a richer CLI output, many commands support a --json flag. Use the powerful jq tool to query the results. We noticed that heroku was one of the top commands users run. We learned that many users were running it to get a holistic overview of their account. We re-ordered the output so it would be in an order that would make sense to you - and showing your starred apps first. We also added context that would give you a Dashboard-style view of the current state of those apps and how they fit into the bigger picture, including pipeline info, last release info, metrics, and errors. At the end of the output, we give guidance on where you might want to go next - such as viewing add-ons or perhaps apps in a particular org. We’ve used color to help you quickly read command output. We’ve given some nouns in the CLI standard colors, so that you’ll easily spot them. In the example above you’ll notice that apps are purple, example commands are in blue, and the number of unread notifications is green. We typically specify errors and warning messages in yellow and red. We’ve tried to be mindful with color. Too many contrasting colors in the same place can quickly begin to compete for attention and reduce readability. We also make sure color is never the only way we communicate information. You can always disable color as a user, by adding --no-color or setting COLOR=false. Our new CLI makes greater use of flags over args. Flags provide greater clarity and readability, and give you confidence that you are running the command correctly. Which app is being forked and which app is the destination app? It’s not clear. The input flags specify the source and destination with --from and --to so that it’s very clear. You can specify these flags in any order, and still be sure that you will get the correct result. ...we know without question that the next thing to complete is an app name and not another flag or other type of argument. 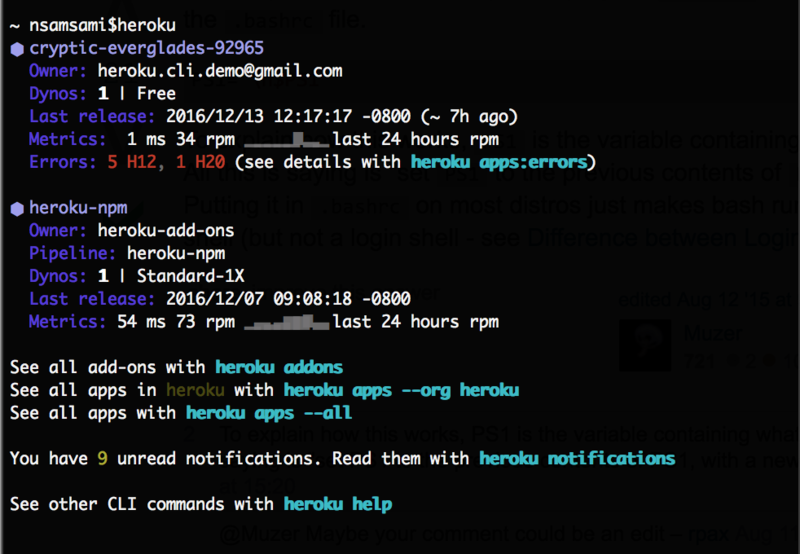 These are just some examples of the work we’ve been doing to standardize and improve the Heroku CLI user experience. You can read more in the Heroku Dev Center CLI article. We’ve also published a CLI style guide that documents our point of view on CLI design and provides a clear direction for designing delightful CLI plugins. As always, we love getting feedback from you so try out the new CLI and let us know your thoughts.